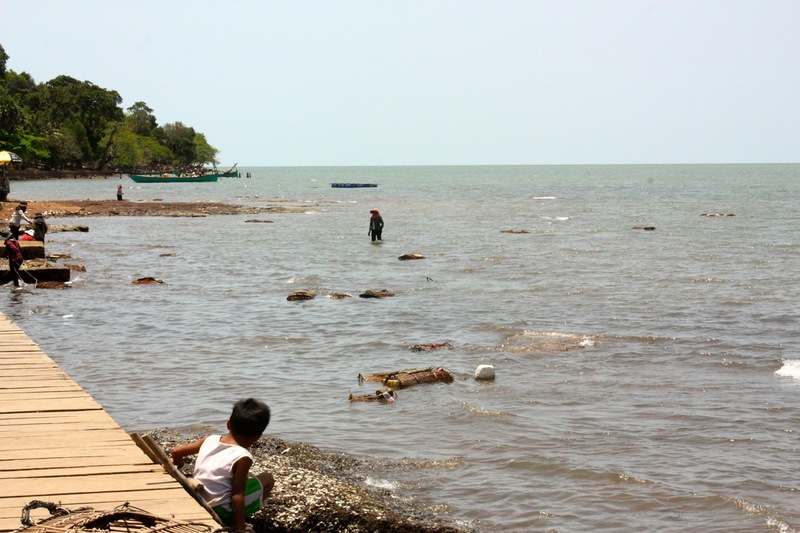 After Kampot we decided to head to Koh Kong, which is a big town right on the Cambodian/Thai border. 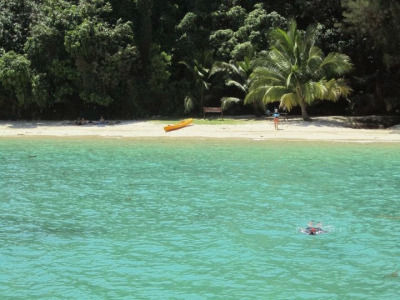 There is a big national park there and there are quite a few options to do home stays there. 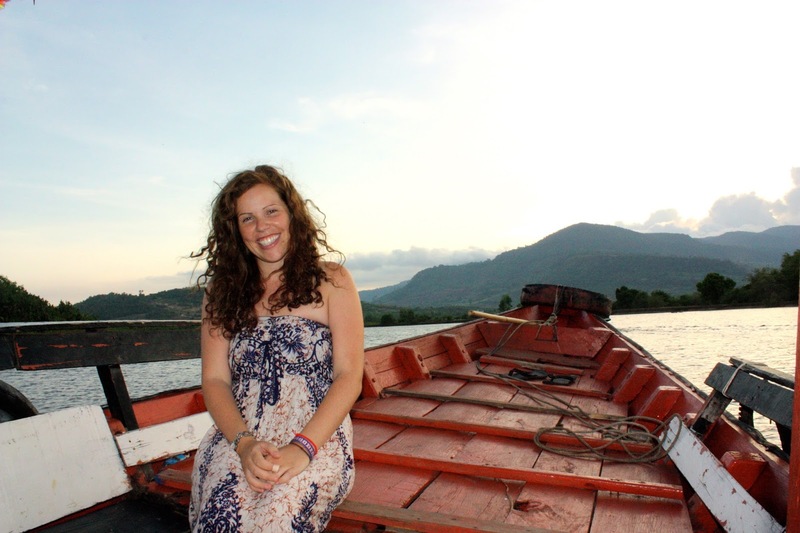 We decided the night before we left Kampot that we would do a home stay for a couple of days in the mountains. We were both very excited about it and had called the company the morning that we were leaving to confirm. 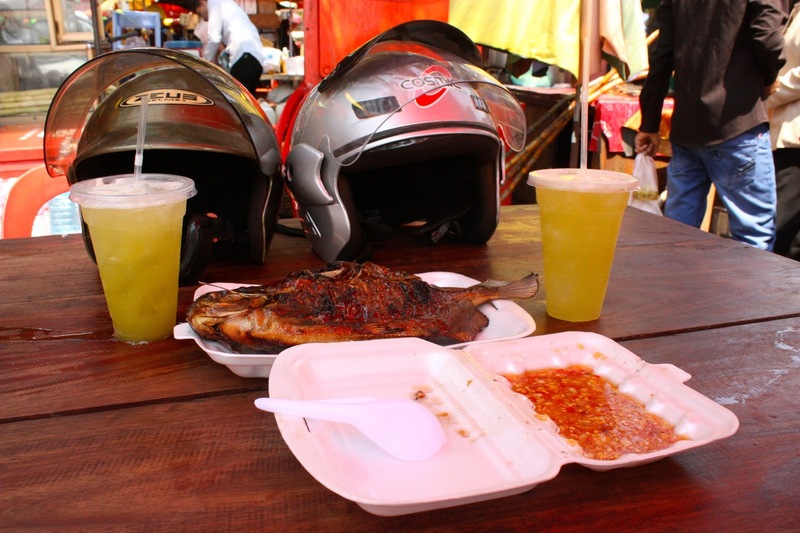 They said that they had a place for us to stay and that we would be able to get motorbike taxis from the Koh Kong bus station. 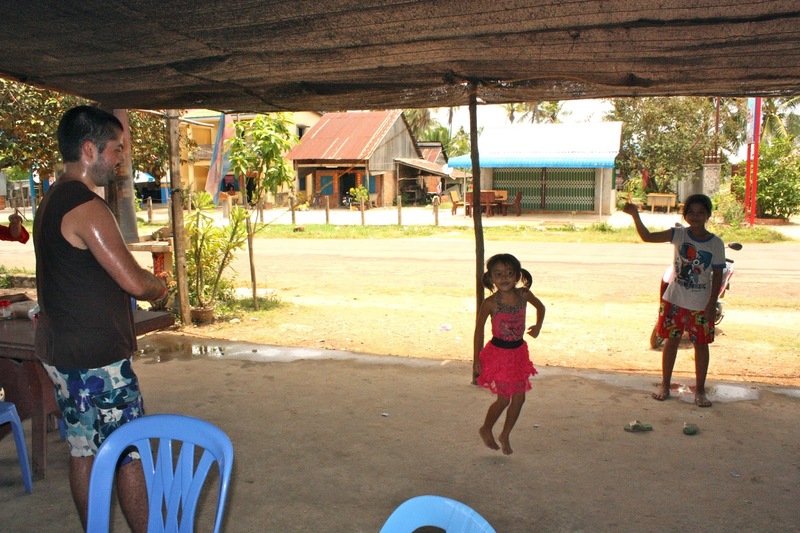 We had told them that we were leaving from Kampot and would call them when we arrived at the Koh Kong bus station. We had booked our bus ticket with the guesthouse that we were staying at. The bus ticket cost $12 each; which is by far the most expensive bus ticket we had in Cambodia. All of the previous buses that we had taken were either minibus to regular bus. Every one of them had air-con and were quite comfortable to ride in and usually cost between $6 and $8. That morning an old disgusting minibus came to pick us up. We weren’t alarmed because a lot of times in Cambodia a bad bus will come and collect you to bring you to the bus terminal to catch your bus. We got on this bus and it was full of locals…so full in fact that there was only one seat for the two of us (it was a seat that you pull down as extra). Still believing that this would bring us to the terminal we went around town and picked up more and more people. Eventually there were 22 people in a 16 seater minibus. And then it happened, we started driving out of town and kept going! About 20 minutes into the journey we resigned to the fact that this bus would be taking us the whole way to Koh Kong (6 hours away). There was no air-con and as I said earlier myself and Jason were sharing a seat. We were so angry, not because of the fact that we were taking a local bus but because they had completely ripped us off by charging us a ridiculous amount each for the tickets. If we paid $3 each for them then I would have been quite happy…but $12 EACH!!! Things just got worse from that point, it was disgustingly hot and a child in front of us started puking (he actually got sick all over the man next to him) Then the bus broke down so we had to wait while they fixed it. While waiting we decided to ring the guesthouse and ask for half of our money back (even if they did give it back we would still be overpaying) since technically we paid for two seats and were sharing one. Of course we didn’t get any money back but instead they tried to get others to move so that we could have two seats. This wash;t what we wanted at all since everyone else was just as cramped as we were. After telling them that it was ok and that we would share a seat we had to accept the fact that we had gotten ripped off. Along the way we stopped at a little restaurant and we ordered some food, there was a pig nearby that was eating everyones scraps that fell on the floor. It was an interesting place that unfortunately had us feeling sick that night. 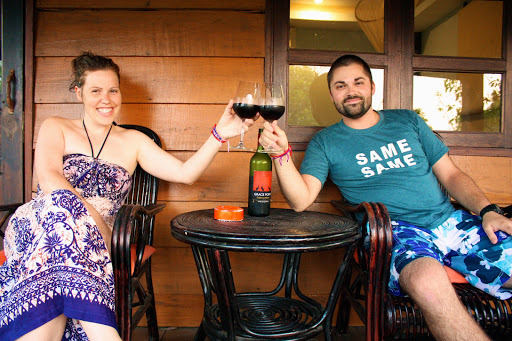 We ended up staying in the border town and being as fed up as we were decided to leave Cambodia the next day and go to Koh Chang. 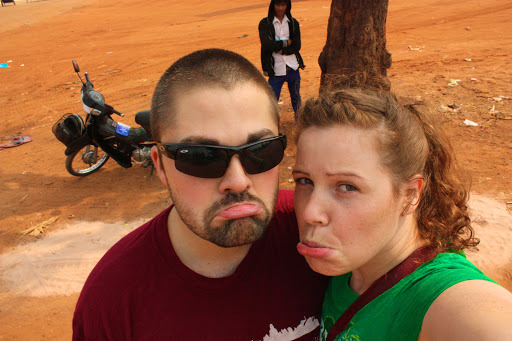 We were both sad that that was the last experience that we had in Cambodia but it didn’t stop us from having amazing memories of the wonderful country and it’s people. 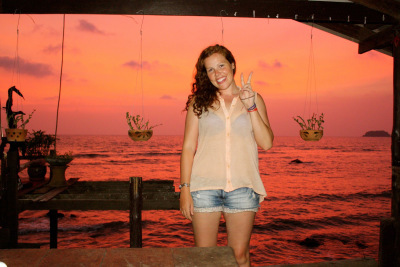 Tips: DON’T book your bus with Long Villa guesthouse in Kampot. We have written about our experience on trip advisor and we weren’t the only ones that this happened to. After our time in Phnom Penh it was time to head down south. Jasons birthday was coming in a couple of days so as a present to him (and a little one to myself too) I booked us into a nice hotel in Sihanoukville for a couple of days. The resort that we stayed in, Pagoda Rocks, was absolutely beautiful. It was on the top of a hill with a beautiful view out over the ocean. Our room was a really big bungalow with a lovely balcony to enjoy the views. 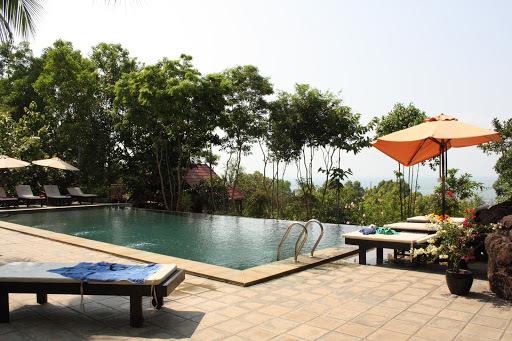 But, probably the best part about the resort was the pool, it was a beautiful infinity pool. When we arrived we definitely felt a little out of our comfort zone with people helping us with our bags and even offering us complimentary shakes! 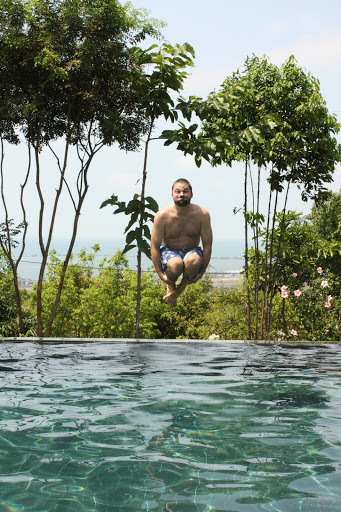 Jason messing around in the pool. 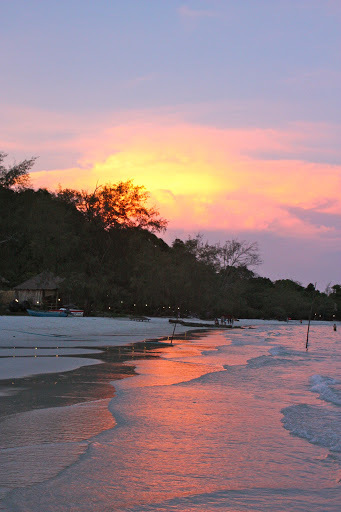 After our couple of days in paradise it was time to stay in downtown Sihanoukville for a couple of days. I’m not going to write much about our time there as we both pretty much agree that it’s been the worst place of our travels so far. It’s just full of young drunk backpackers who have no regard for anything and older sleazy men with their poor young Cambodian “girlfriends”. The latter really makes me sick. I would definitely recommend to everyone not to stay here, unless like us you were planning on going to Koh Rong, or you like partying. 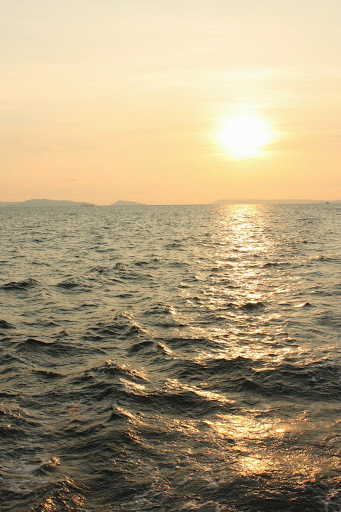 Once we left Sihanoukville it was time to get a ferry to Koh Rong. 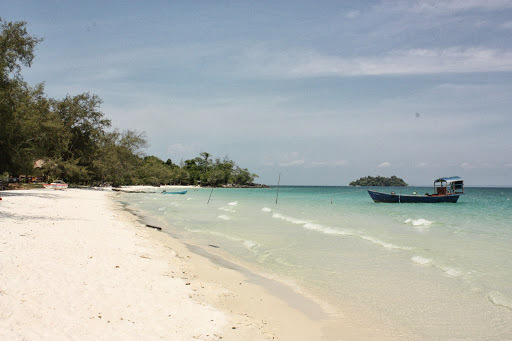 Koh Rong is a small island just off of the coast of Cambodia, we had heard some really great things about it but were a little worried after our time in Sihanoukville that it would be similar to it. Luckily it couldn’t have been more different from Sihanoukville! 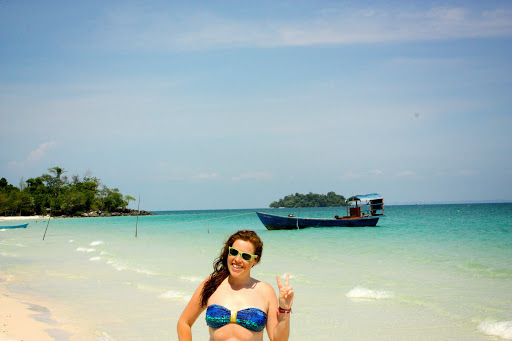 Koh Rong basically is paradise. 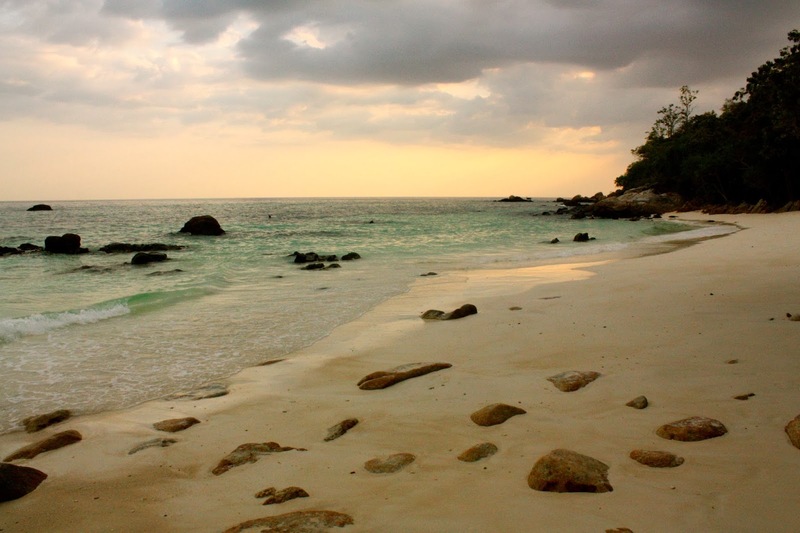 The further down the beach you walk the quieter it is, the whiter the sand is and the clearer the water is. The sand was the type that squeaked when you walked on it. 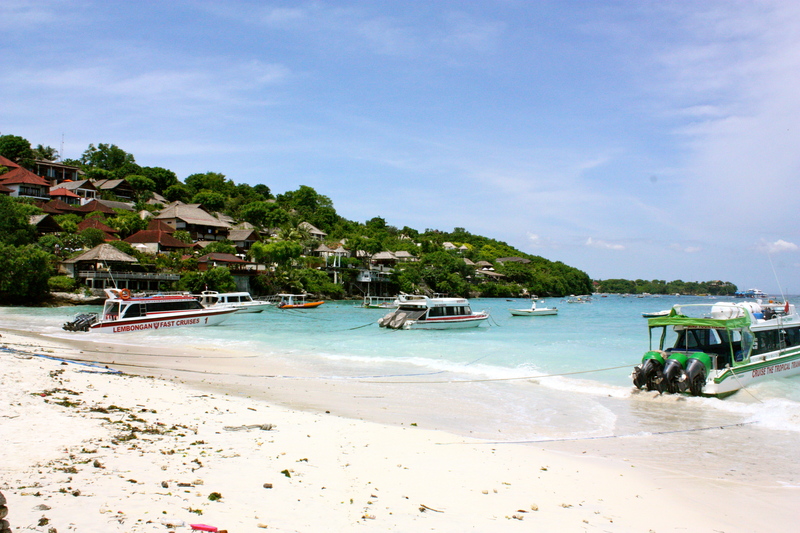 We were lucky to get a bungalow right on the beach. It was really nice and we had a patio which had a beautiful view of the water. 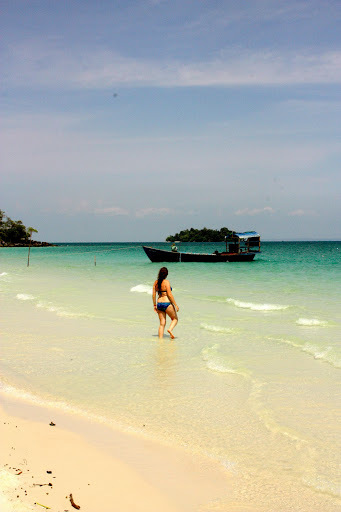 We spent our time on Koh Rong just swimming, sunbathing, reading up about Nepal and of course eating. We really loved our time there. 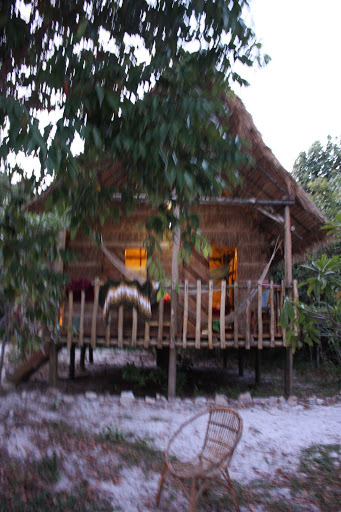 Our hut was right on the sand so we woke up to the sound of the waves in the morning and we had a shared bathroom which just made it more island, rustic style. Once again we witnessed an incredible sunset in the evening. 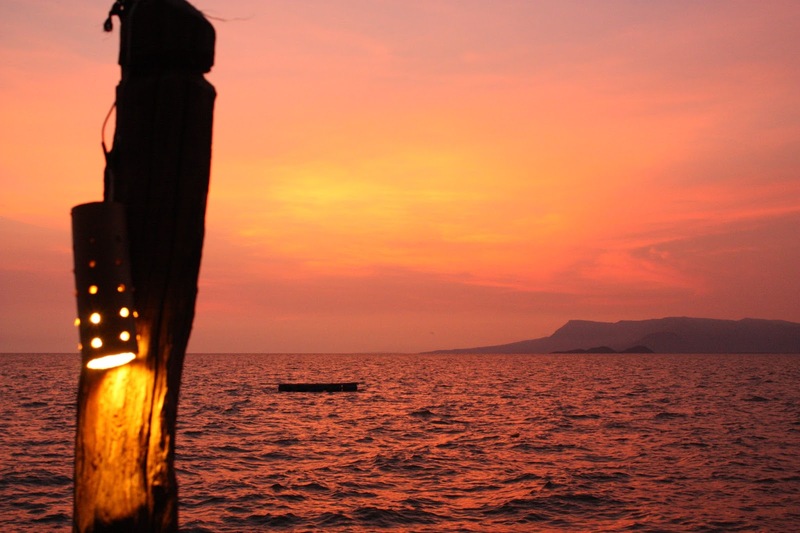 South East Asia really has spoiled us when it comes to sunsets! They just keep getting better and better! 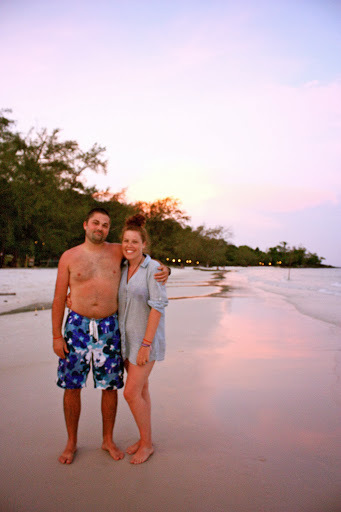 Our time in Koh Rong was so relaxing and enjoyable, we really didn’t want to leave, especially to go back to Sihanoukville! 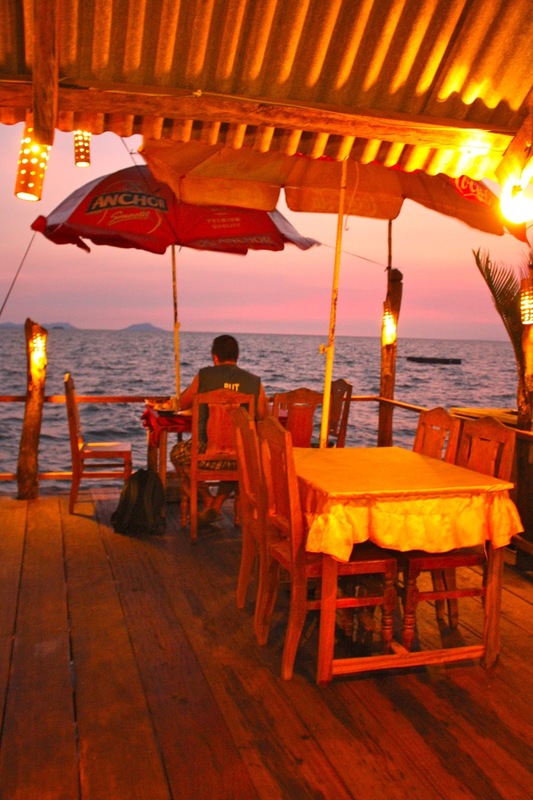 We only had to spend one more night in Sihanoukville to book a bus to our next destination…Kep! 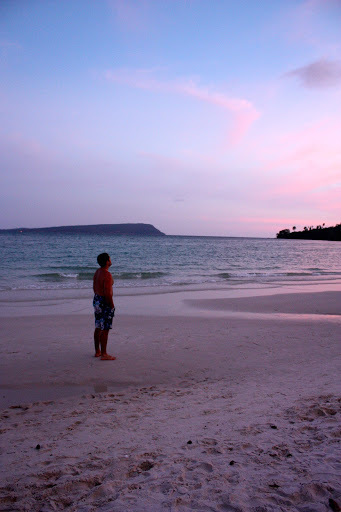 Jason taking in the sunset. 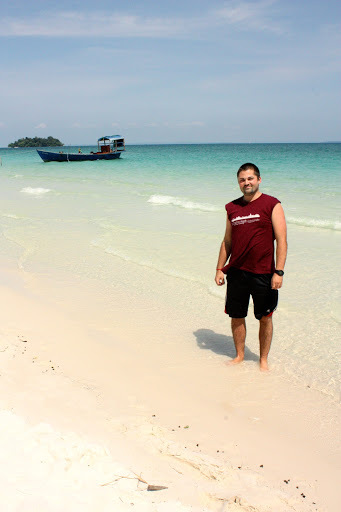 Jason on Koh Rong, absolutely amazing! It’s been so long that I can’t remember other details, sorry! 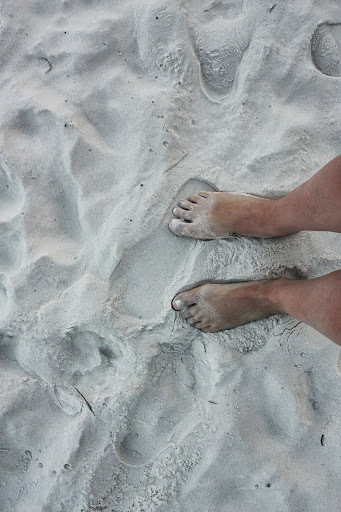 The sand was so fine that it squeaked when you walked on it. Jason and I enjoying the sunset. Finally! I just want to apologise for the lengthy delay of this entry. I guess life just kind of got in the way and the wifi connections haven’t been as good in Nepal and India as they were in South East Asia. 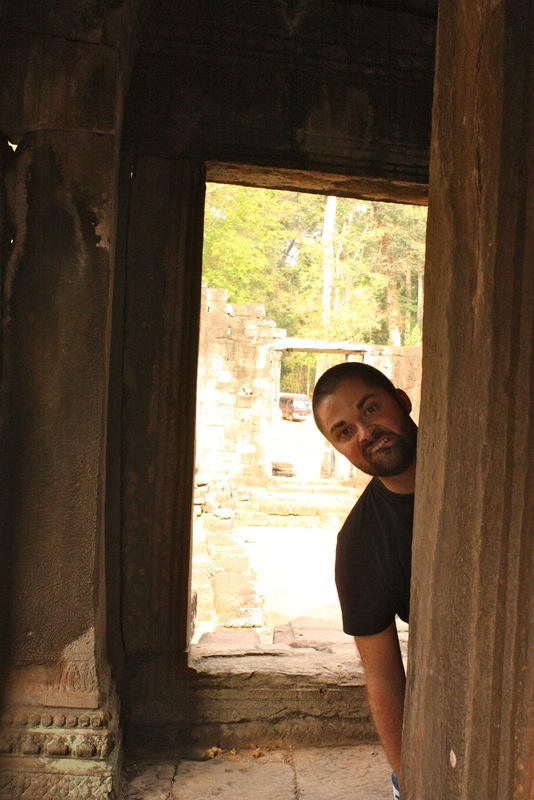 Anyway, without further adieu, here are Jason’s thoughts on Phnom Penh. 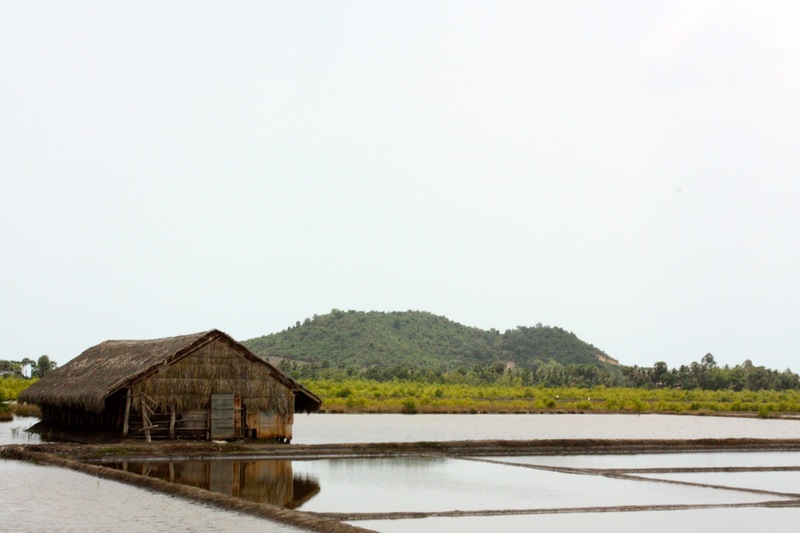 From the sleepy town of Battambang, we went to Cambodia’s vibrant capital city of Phnom Penh. As explained in the last entry, we organised a bus from our guesthouse in Battambang (The Seung Hout Hotel) to Phnom Penh. We chose a mini-bus that promised wi-fi for $10 but, unfortunately, the wi-fi didn’t work, not a big deal though. We could have taken a cheaper bus for $7. It took about 4-5 hours to get there including a half hour break at a questionable roadside restaurant for lunch, complete with chickens wandering around. I (Jason) have come to not trust these kinds of establishments as I have gotten sick at every single one of them. Grainne did have some lunch there though. As we arrived in P.P. 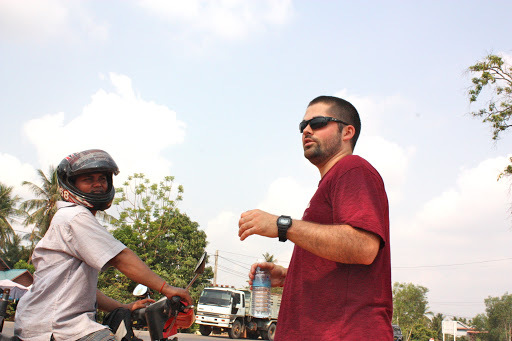 we were greeted by the usual swarm of vultures (tuk-tuk/motorbike drivers) trying desperately to get us to hire them. I realise that they are just trying to earn a living but it gets frustrating when you get off the bus in a new city, disorientated, tired and immediately having 10 or more people get in your face trying to scam money out of you. Anyway, once we got past all of this P.P. was great. That same day, we booked a wildlife tour for the following day that was located just outside of P.P. 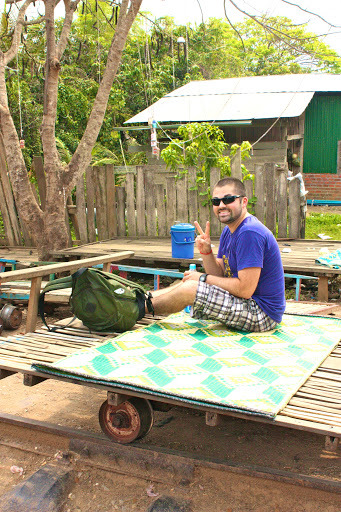 We spent the rest of the day just lazing around until we met my friend Brian, who’s doing the Peace Corp. in P.P. for dinner. Brian took us to a good/cheap Indonesian restaurant located near the palace. The whole meal costed us about $2 including drinks. It was really nice catching up with Brian because in my whole time living abroad, I haven’t had a chance to hang out with anyone from home. The next day we went to the wildlife park. Overall, it was a good experience. Our guide seemed very knowledgeable and we got the chance to intetact with some very interesting animals including gibbons, elephants, otters, crocodiles, birds and pythons. Grainne even taught one of the birds to say hello in Korean (an-yong). 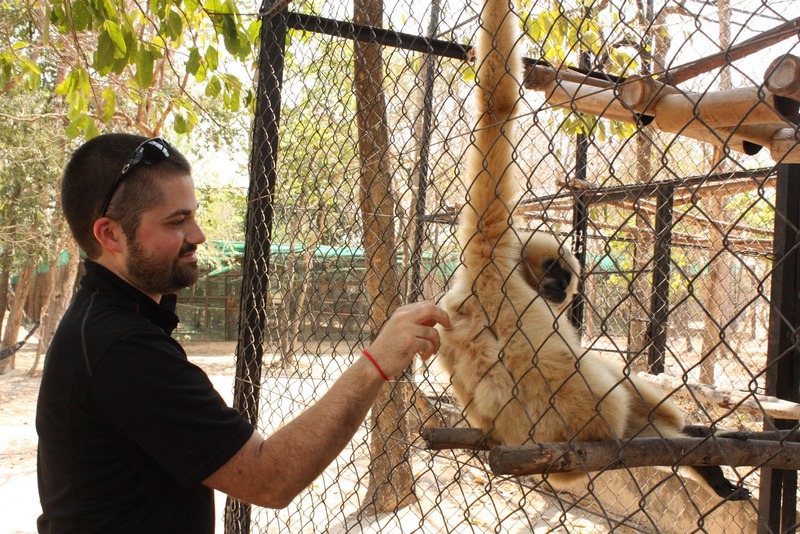 The wildlife park rescues animals all around Cambodia, rehabilitates them and tries to place them back in safe places in the wild. The price of the tour was about $30 and lasted about 5 hours. 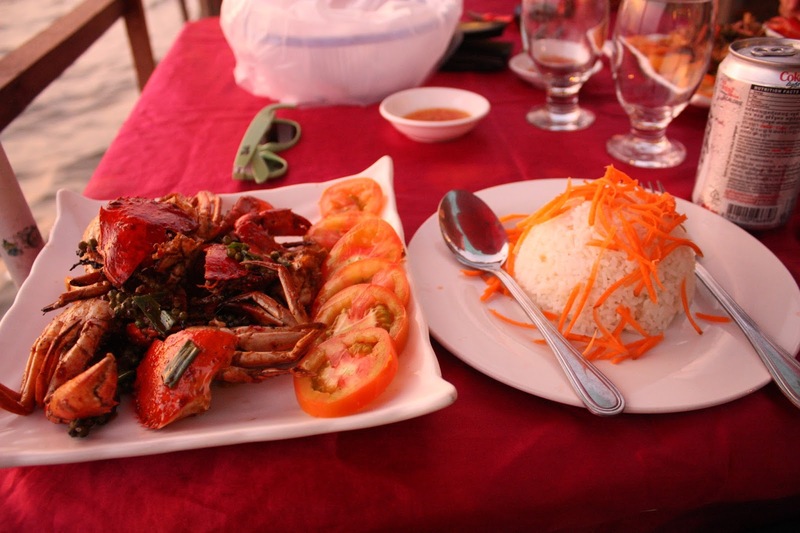 Included in the price was a really good Khmer lunch made by the tour guides wife. They just loved getting their backs scratched! Even though the animals are in cages, this wildlife park does incredible work. Every single animal that is at the park has been rescued from people or bad situations (except for the Lions who they inherited from the zoo that was there before the park). 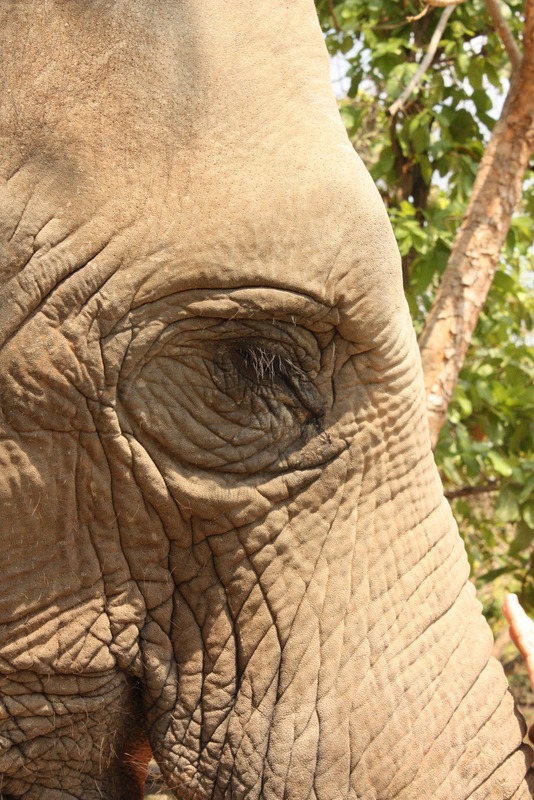 Incredibly, about 80-90% of the animals are placed back in to the wild within their first 3 months at the park. The others are animals that wouldn’t survive in the wild. 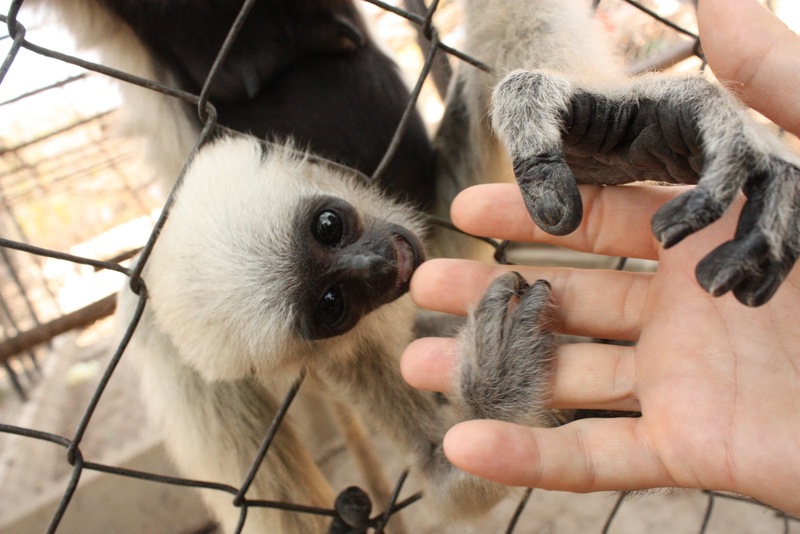 They also have successful breeding programs, only breeding animals that will be released back in to the wild. 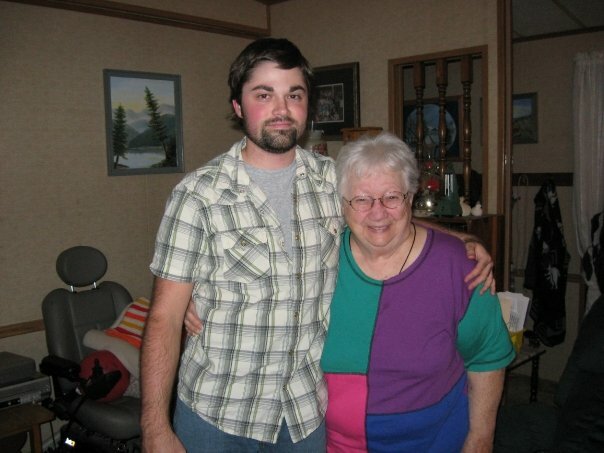 she had no teeth so it was all good! After this we net Noel, Kate and Jayne briefly at the Toul Sleng prison and the Killing Fields. 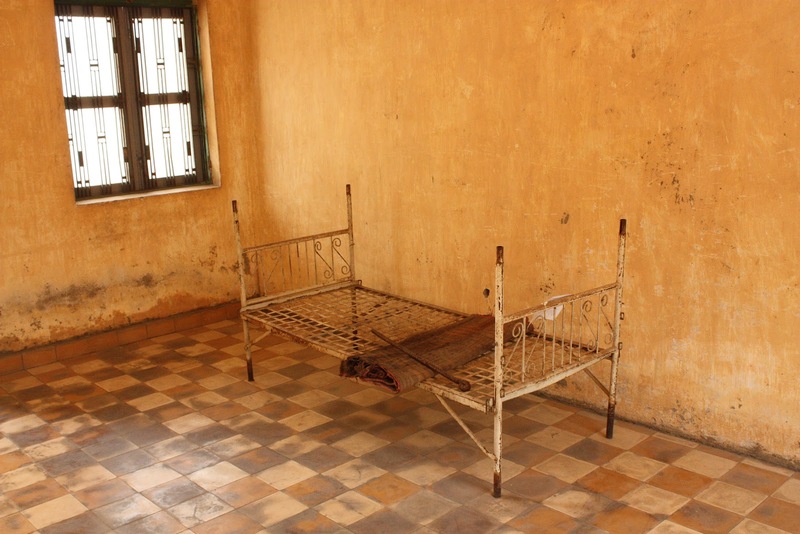 The Toul Sleng prison is where the Khmer Rouge housed “prisoners of the state”. People were imprisoned in this old school building for various reasons, but mostly they were educated or refused to comply with Pol Pot’s vision. Most prisoners were tortured here until they confessed to false charges. 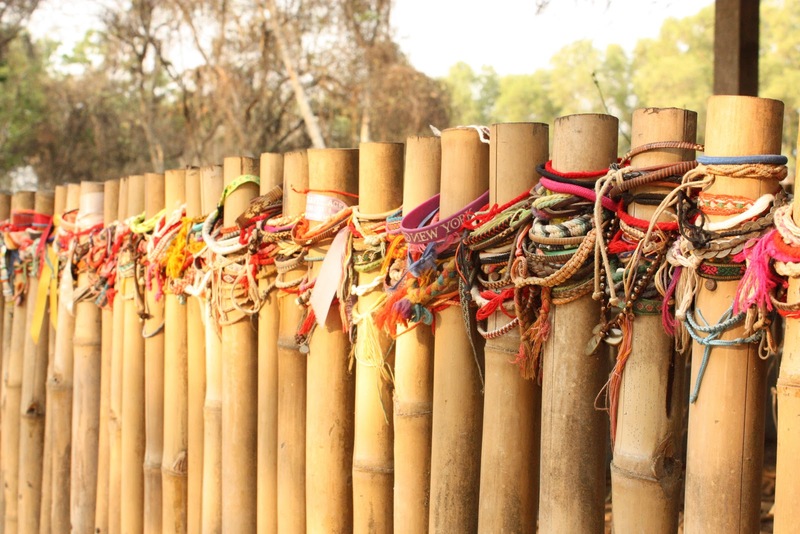 Many of them died in the process and if they didn’t die, they were sent to the killing fields and died there. 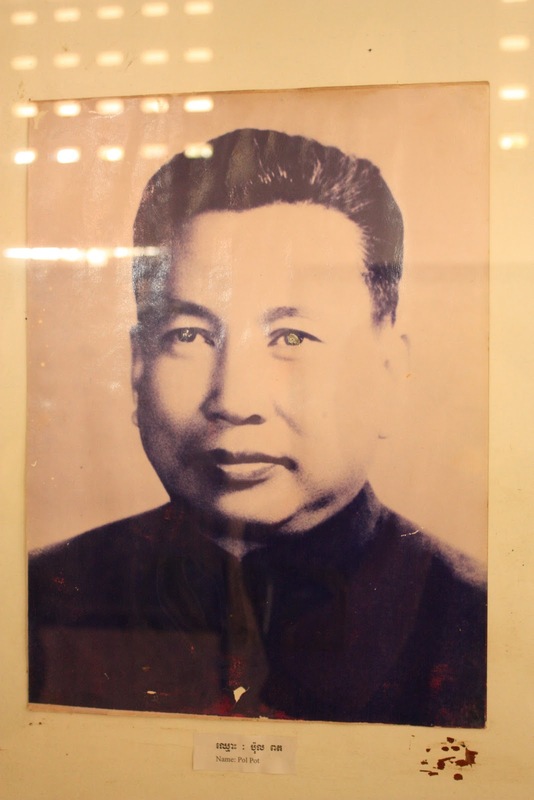 Pol Pot. The leader of the Khmer Rouge. 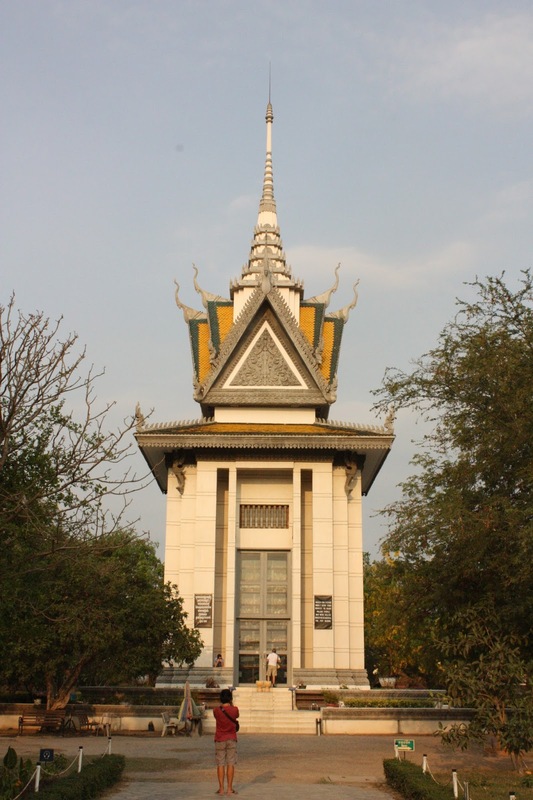 After visiting the grusome Toul Sleng prison, we went to the killing fields where we took an audio tour. 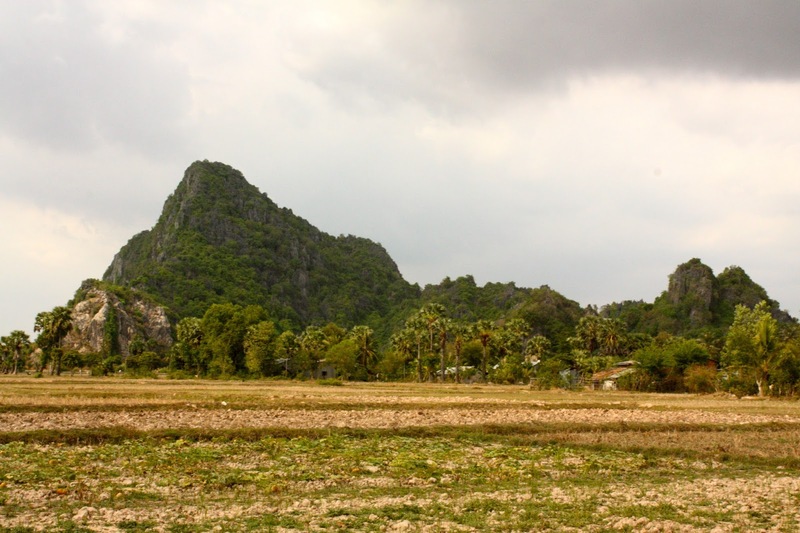 The narrator was a Toul Sleng survivor who gave a chilling account of what happened there. It was truely heartbreaking. Over time, bits of bone and teeth resurfaced due to rain. 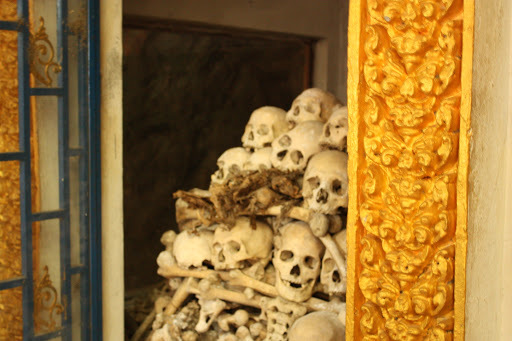 At the end of the tour, you get a chance to visit the memorial stupa which contains many of the skulls of the victims that had died at the killing fields. However, there are still many graves there that have not been excavated. It really is a chilling sight to see. Later in the evening, we met up with Noel, Kate and Jayne for dinner and goodbyes. The following day we went to a large market that used to be the biggest in Southeast Asia where we got some t-shirts and other bits and pieces. This brought an end to our time in Phnom Penh. 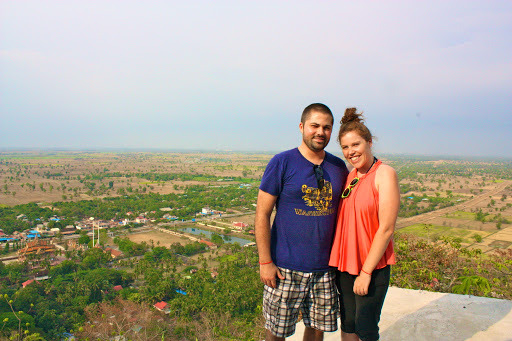 Battambang is probably one of our favorite places that we have been to yet. 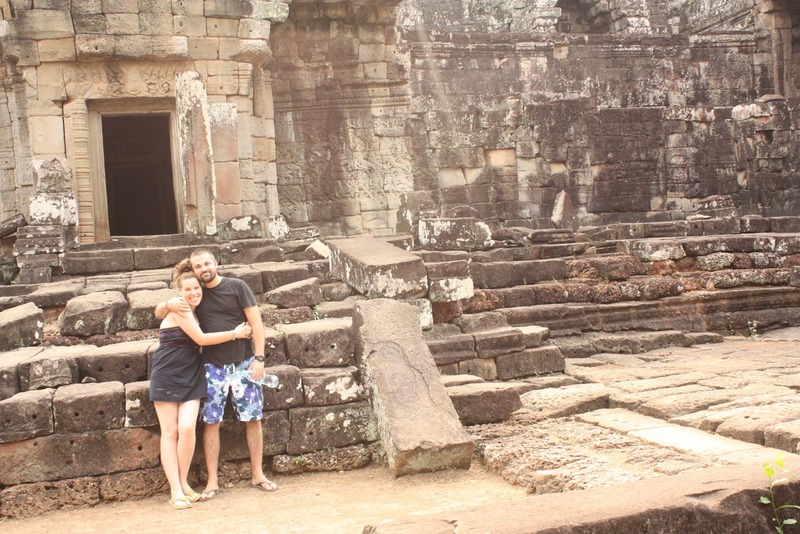 We had such a great relaxing time there and had a chance to see the “real” Cambodia. But in order to get there we had to get the bus from Siem Reap. We were waiting for our bus that morning in our hostel when it finally came, we jumped on and it dropped us off at the bus station. there were people selling things all around us as we got off and everybody else on the minibus that brought us to the station were getting on a certain bus. We packed our bags underneath and jumped on too. About 30 minutes into the journey a man came over to us and asked us where we were going to. 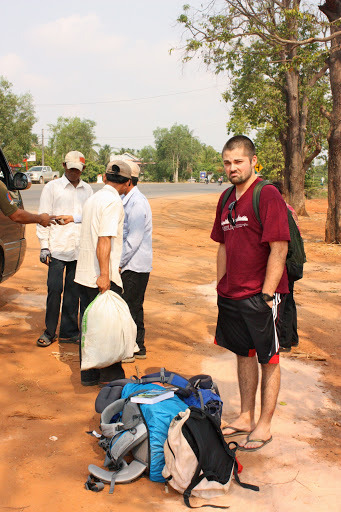 We told him we were going to Battambang and his look said it all. “This bus is for Phnom Penh” he said. All we could manage to say was “Oh.” He called the bus company and put us on the phone with an English speaking person who told us that we were on the wrong bus (Phnom Penh is about 6 hours south, while Battambang was northwest 6 hours) Luckily she told us that the bus driver would let us off the bus somewhere and another bus will come and collect us. About five minutes later the bus stopped and we were let off at a petrol station in the middle of nowhere with the promise that another bus would be along in ten minutes. I have to admit that those ten minutes were some of the best minutes I’ve had so far while traveling. 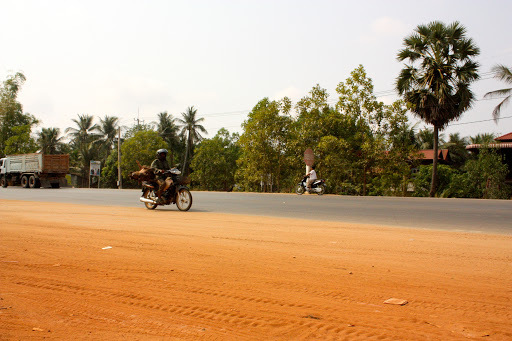 We really got to see how wonderful the Cambodian people are, we had people waving at us from their motorbikes and two different people stopped to make sure that we were ok, one woman with her mother and daughter on the bike with her. While waiting we also got to see some unbelievable things such as a man on his moped with three pigs strapped to the back! You can’t really see but this man has a pig on the back of his bike. We’ve also seen bikes with 3 pigs on the back. Like they said, about ten minutes later, a bus pulled up and we were on our way to Battambang. 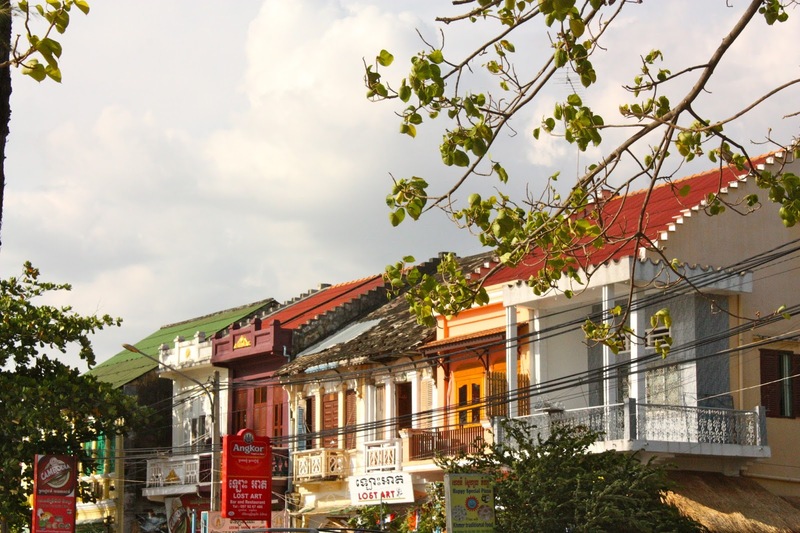 Battambang is the second biggest town in Cambodia but it is so laid back that it’s hard to believe. When we arrived in Battambang there were some tuk-tuks waiting to show us their guesthouses and to bring us to them. When there is a group of people all offering similar things, my rule is to go with the cutest oldest man. (it seems to have worked so far!) Our person of choice this time was Mr. So Phat. He was such a nice man and brought us to our guesthouse, the Seung Hout hotel. We were surprised to find out that it had a swimming pool and was well in our budget. Our first day was spent chilling in the pool and strolling around the town. It was such a nice relaxing town. 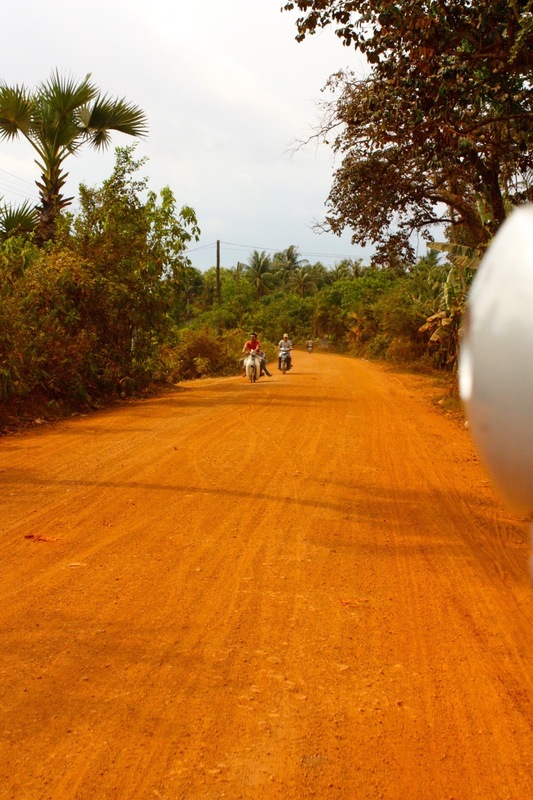 I think this is why we loved Battambang. The last couple of years everywhere that myself and Jason went to together we always managed to get off of the tourist trail and feel like we are really seeing the country (Korea included). But since this journey has begun we have just felt like there is no way to get away from other tourists…that is until we arrived here. There were only a handful of other tourists around and since all the bars close by 10p.m. here there was no party crowd. 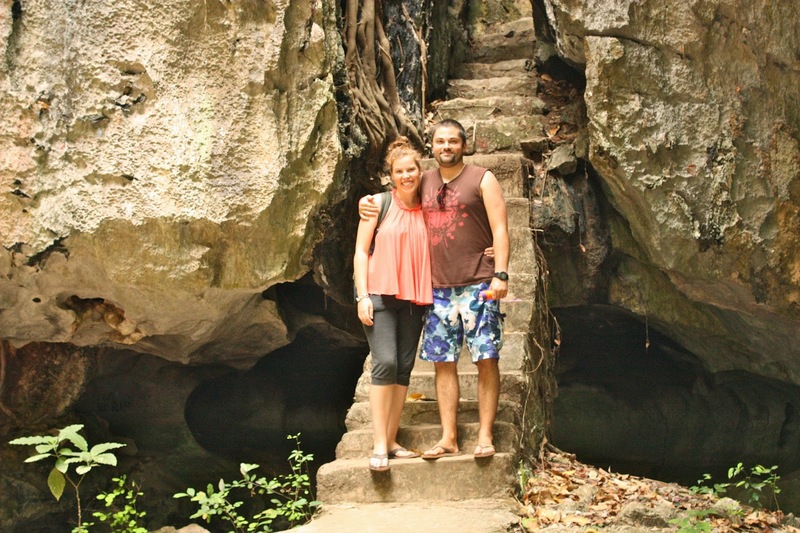 On our first full day in Battambang we decided to ask Mr So Phat to take us on a trip to see the bamboo train and the killing caves. Mr So Phat had practically begged Jason for a job the day before so we decided it would be nice to ring him and ask him to take us. He was at our hotel within ten minutes and was so happy. All ready for the bamboo train ride. The bamboo train is probably the number one touristy thing to do in Battambang, but even so, we only saw about 7 other people there. 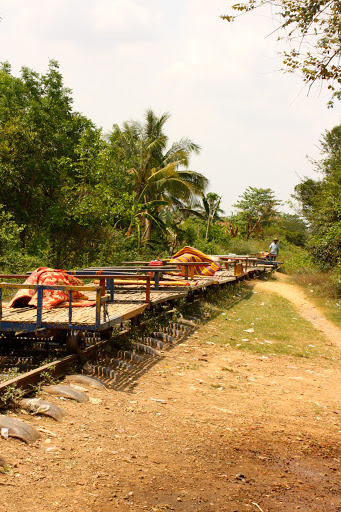 The bamboo train is a network of very basic “trains” made from bamboo (hence the name) that the Cambodians used after the Khmer Rouge had been in power. At that time there were hardly any cars motorbikes or taxis so people found it nearly impossible to move things around the country. 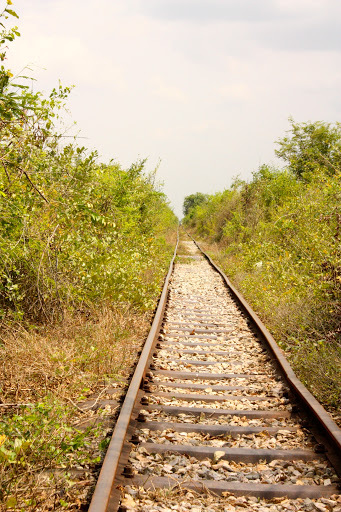 Then these rails were made in between the bigger towns that allowed people to transport heavy things around. In fact, they even used to transport cattle on these things! 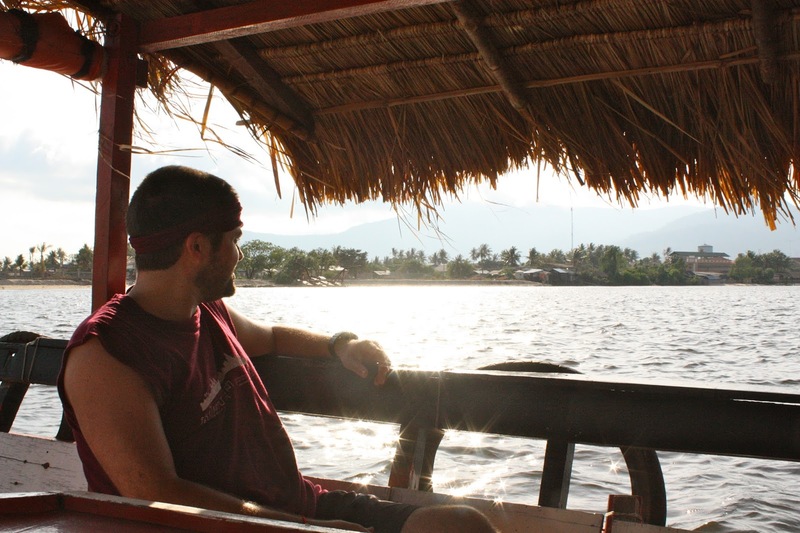 We were allowed the chance to take a ride on the bamboo train for about one hour. It was a really fun experience and actually went quite fast! About halfway through we stopped at this little village for a break and got to play with the sweetest kids. 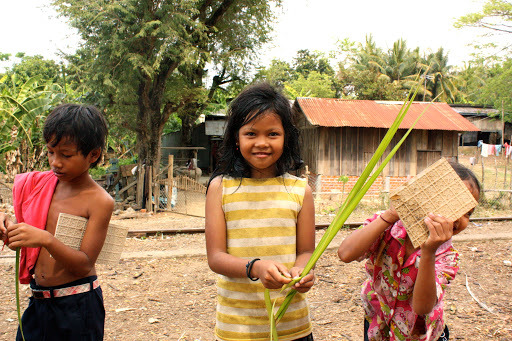 They made us jewelry from leaves and didn’t want any money from us or ask us to buy anything. We really were away from the backpacker trail. One of the boys had great English and was very interested in the fact that we live in Korea. After our break we got back on the bamboo train and made our way back. Because there is only one rail line, if a train is coming in the opposite direction both trains have to stop and one has to be disabled and move to make way for the other. The train back was exciting because there was fierce thunder and it looked like it would rain any second. Beautiful kids in the village that we stopped at. A shrine near the killing fields. Once we got back Mr So Phat was waiting and ready to bring us to our next destination. 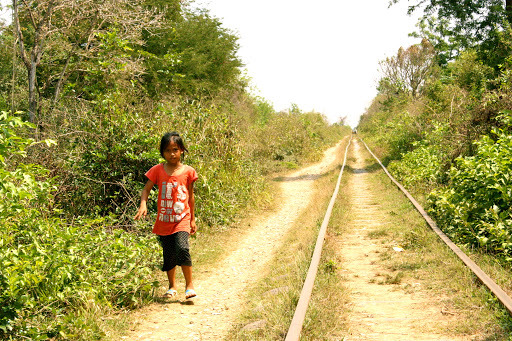 It was quite a distance away, that allowed us to see Cambodian rural life from our tuk-tuk. Luckily the rain never came and it was time for us to go to the killing caves. 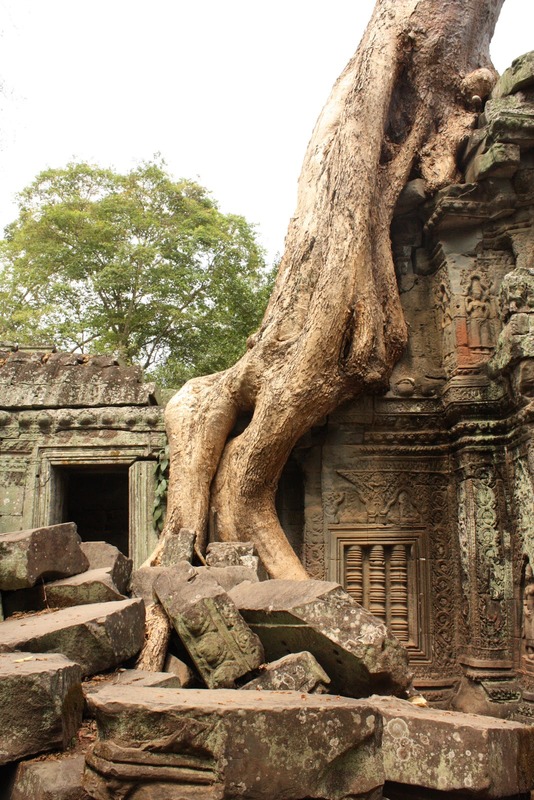 During the Khmer Rouges’ reign nearly 20% of the population was killed. All around Cambodia prisons were set up for people that didn’t follow the Khmer Rouges’ regime precisely or for people that the Khmer Rouge decided to kill for no reason at all. 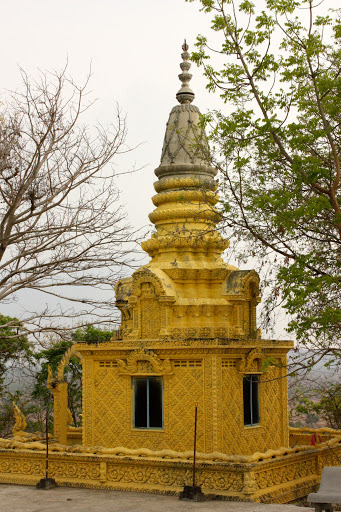 Here in Battambang, the main prison was this beautiful temple on top of a mountain. It is so peaceful there that it’s hard to imagine the horrors that went on. Nowadays the temple has returned and it is being painted with beautiful bright pictures. 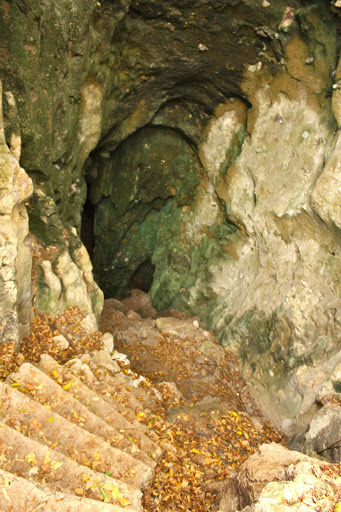 Just a minutes walk away from the temple you come to a big cave. This cave was where the Khmer Rouge would beat and kill the prisoners and then throw their bodies, sometimes dead, sometimes alive, down into the dark cave. There was also a separate cave opening where they threw the childrens bodies. It was very grim and has been made into a prayer area. But the skulls of some of the poor people that suffered are on show here. 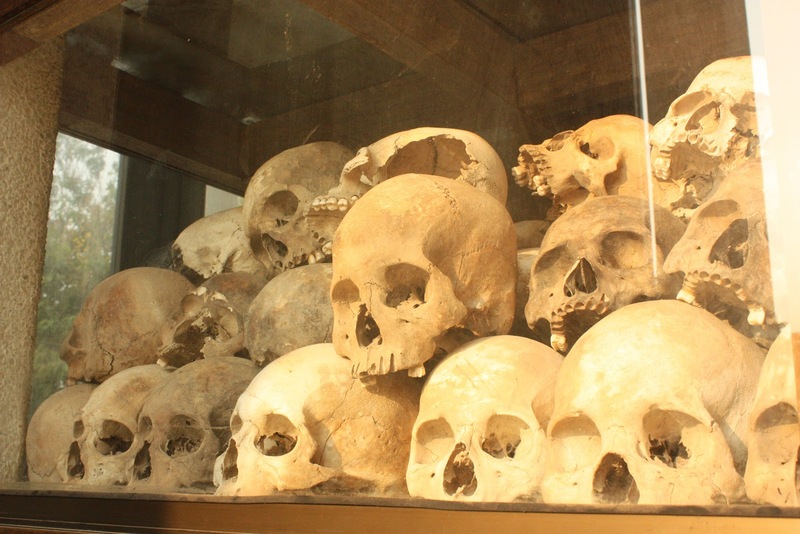 I’ll explain the reasoning behind the public display of the skulls in our Phnom Penh blog. 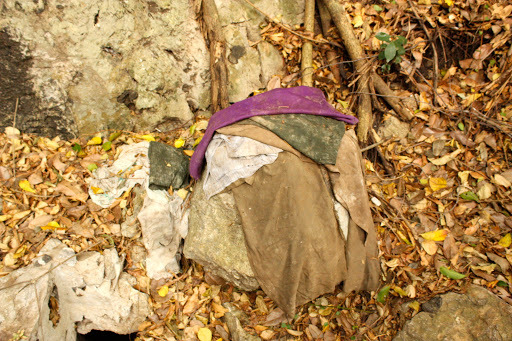 Some of the clothes of the victims. It was a very somber experience visiting the caves but is also important to see while visiting Cambodia, we also got to learn far more about the Khmer Rouge regime in Phnom Penh. Some of the skulls at the cave. 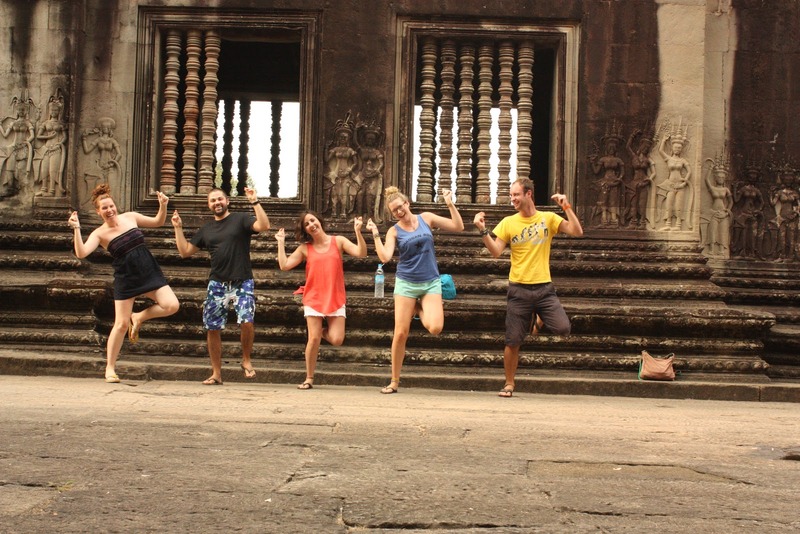 Overall we had a wonderful time in Battambang. The town was so laid back and the architecture was beautiful. 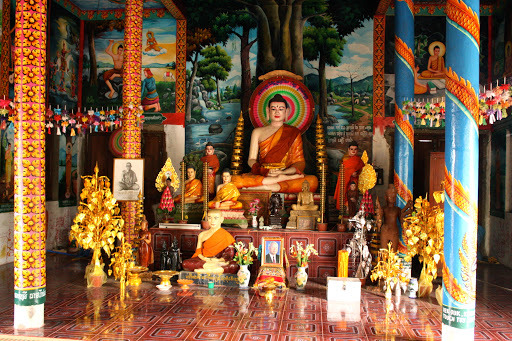 I would definitely recommend a trip to Battambang while in Cambodia. After our stressful border crossing we were all excited to get some rest. My friend had recommended us to stay at The Siem Reap hostel, so I had booked all five of us into a dorm room together beforehand. 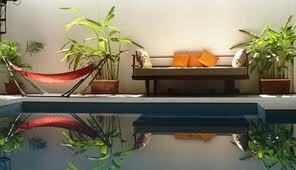 The Siem Reap hostel is an amazing place to stay if you go to Siem Reap. 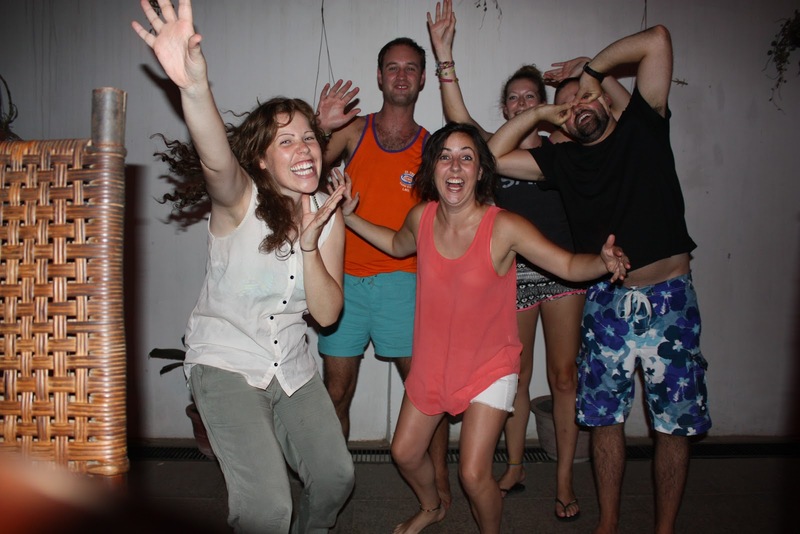 It is very much like a hostel that you would find in Australia, but without the expense. The best part about this hostel was that we had a nice pool, a movie room and a free pool table. 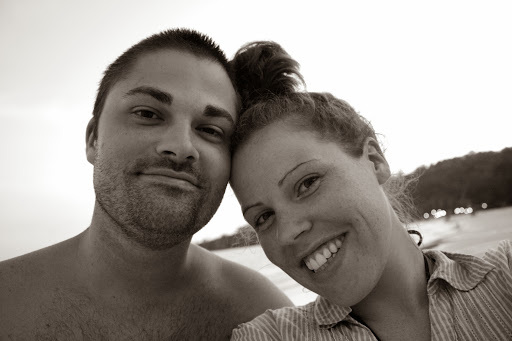 We arrived into Siem Reap at about nine in the evening so we just got some dinner and went to bed. The next day we all decided that we deserved a rest day so we all just lazed about by the pool, eating, drinking and napping. Noel, Kate and Jayne got massages also, it was such a nice relaxing day! 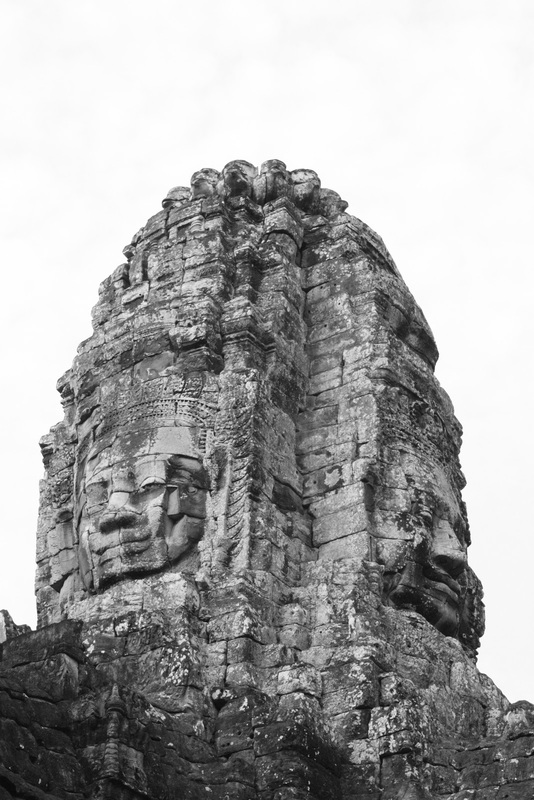 Bayon temple; There were hundreds of faces on the temple. We arrived at Angkor Wat and it was still dark so we found a spot to watch the sunrise. I had stood in that exact same spot four years ago with Louise waiting for a sunrise too, and that time it was too cloudy so there was none. Just when we arrived it started raining. 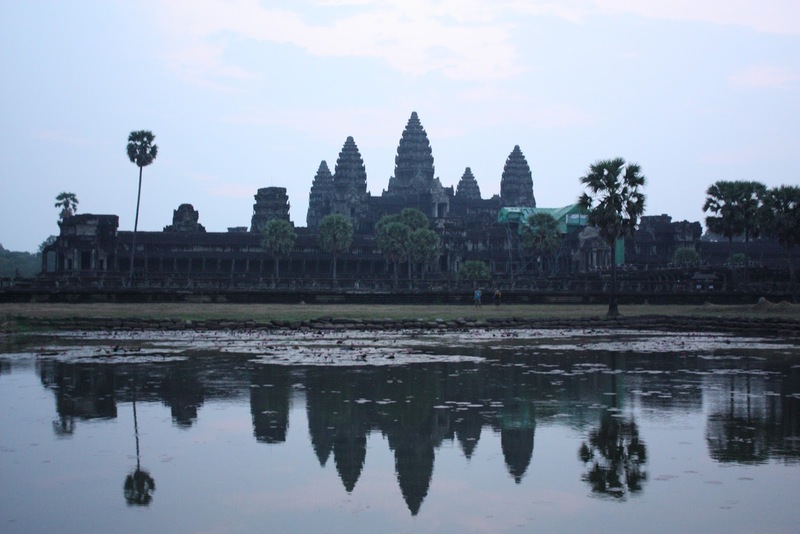 I was devastated thinking that only I could go to Angkor Wat twice for sunrise and not see a thing! Luckily the rain stopped and the clouds cleared, I was finally going to get my sunrise!! Unfortunately the sunrise wasn’t as exciting or impressive as we thought it would be, but we still had fun. After sunrise we got to explore three of the temples, Angkor Wat (the biggest one), Bayan (famous for its many stone faces) and Ta Phrom (the temple covered in jungle, this was also used for Tomb Raider). 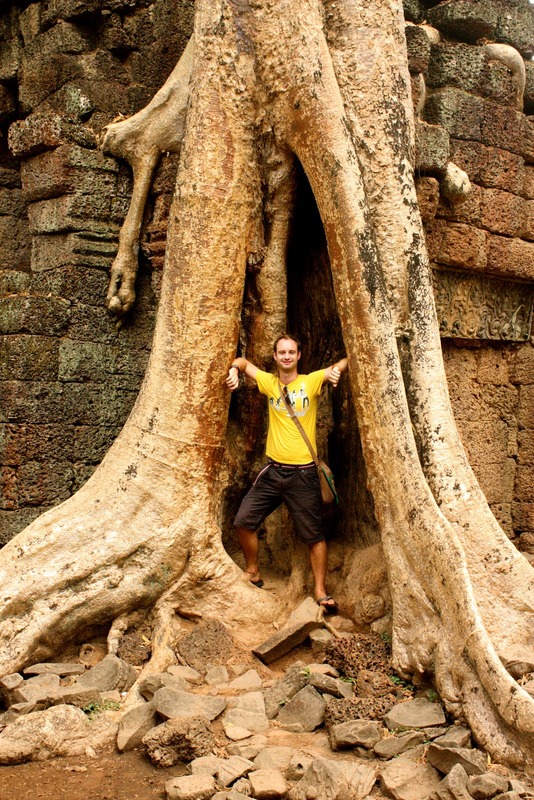 Ta Phrom is my favorite as it is covered in trees and has a very mystical feeling to it. After walking around the temples in the heat we were all wrecked by the time we arrived back to the guesthouse. 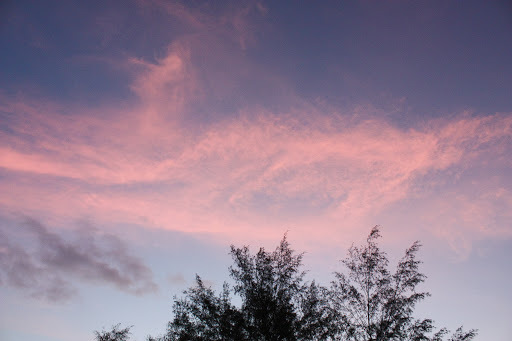 It was fun seeing the temples but I wish that we hadn’t gotten up so early to see the sunrise, as we were all very tired and felt like we couldn’t enjoy the experience to it’s fullest. It was one of those times where something is a lot more fun when you look back on it rather than while you are doing it. After a couple of hours nap we decided to venture out to “pub street.” Pub street is exactly what you think it is, a street full of pubs. It was really strange to see this here in the middle of a small town in Cambodia, there were beggers everywhere and seeing a child no more than seven or eight years old going through all of the rubbish to find some plastic to sell at 1a.m. on a Tuesday night was harrowing. The next day we had a nice sleep in after our early rise the morning before. 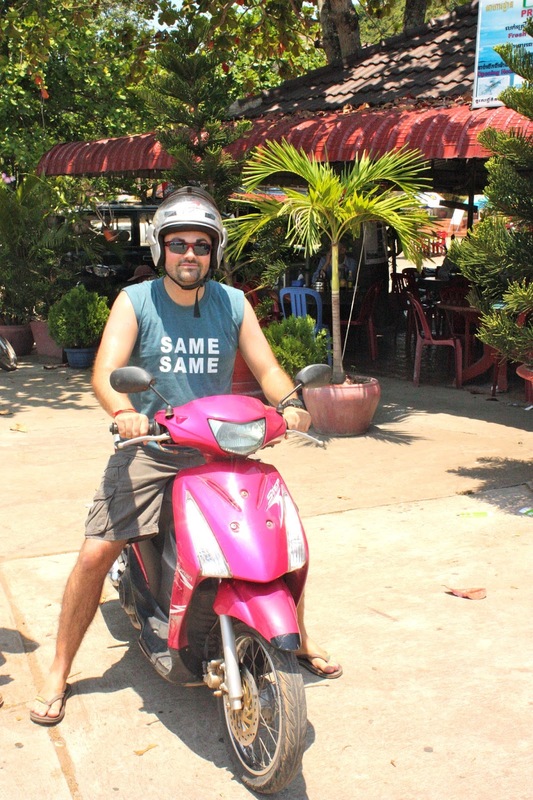 Myself and Jason rented a couple of bikes and cycled around the town. By noon it became so hard to cycle in the heat that we had to return to our hostel dripping in sweat. Today was the day that Noel, Kate and Jayne were leaving us. I had so much fun with them all, it really felt like we hadn’t been apart for long. I was hoping that we’d get to meet up again at some stage. Being back together with my friends really make me miss Ireland and Irish people, you really can’t find anybody like them! I’m sure Jason had a lot of fun meeting them too (although I think he couldn’t understand a lot of our conversations) haha. 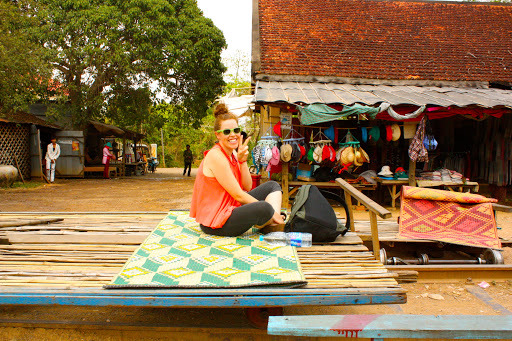 After saying goodbye to “the lads” we just packed our bags and got ready for our bus ride the next day…we were off to Battambang! 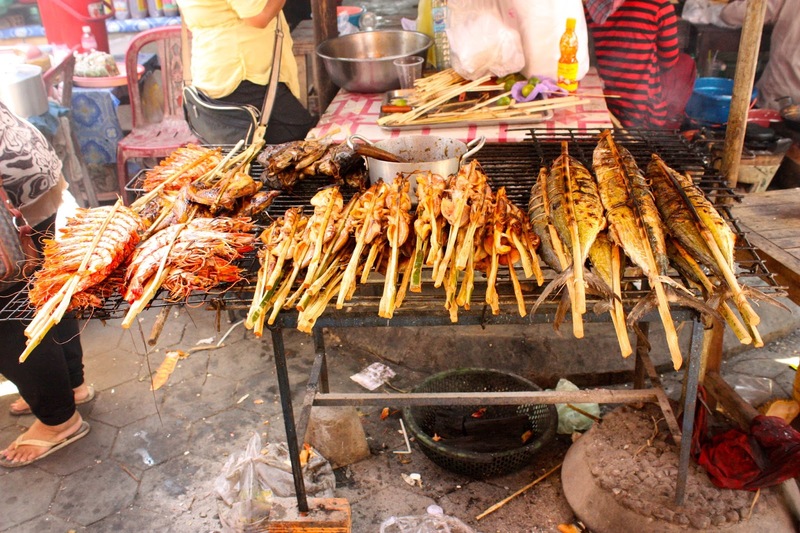 Siem Reap is a nice town, with lots to do both within the town and on the outskirts. I was glad that we got to be there with friends, the best thing about this town is that you can have a crazy night out if you want or just as easily have a mellow night. And of course having the temples in it’s back garden makes this town even better! Accommodation: The Siem Reap Hostel $6 for a dorm bed in a really comfortable 6 bed dorm. Entry into the temples: $20 for a day, $40 for 3 days and $60 for a 7 day ticket.